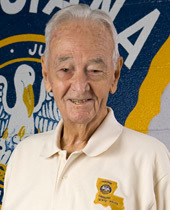 In May of 2000, at the age of 82, Lieutenant Leon ‘Jug’ Carrington set out to prove that the fundamentals of law enforcement were the same today as they were in 1941, the year he launched his career as a Louisiana State Trooper. Jug had officially retired from the Louisiana State Police after 25 years of service but was welcomed back to the force when the Louisiana State Police Reserve was established in 2000. Even after he retired from the force, Jug maintained regular contact with the officers of Troop B. Many things changed from the day he left active duty – new technology, advanced information systems and detailed reporting requirements added more responsibilities to the job Lt. Carrington once held. But despite the enhanced complexities, Jug was adamant that the basics had not changed and he returned to the force at his first opportunity to demonstrate that fact. Courtesy, loyalty, teamwork, leadership, service … these fundamentals of law enforcement are as important today as they were during Jug’s first day on the job back in 1941. It takes more than lectures, however, to pass these principles on to future generations of police officers. It requires trust, finesse and a certain amount of charisma. Teaching through example and sharing a few good stories about how things were done more than a half century ago, Lt. Carrington has captured the attention of a new generation of police officers. Incredibly, many of the officers now learning from his experience were born after the day he retired. Life rewards us with a richness of experience. Sharing the lessons learned from our experience can enhance the quality of life for others. Leon Carrington … Peoples Health Champion.